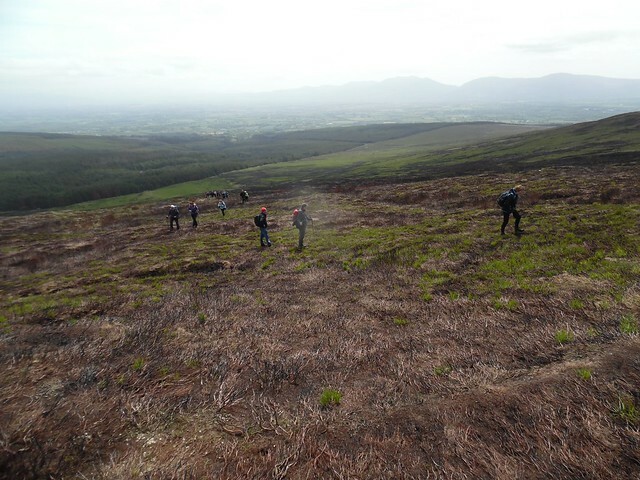 The Bishopstown Hillwalking Festival will take place over the weekend of Sat 21st and Sun 22nd May 2016 to mark the 22nd anniversary of the Bishopstown Hillwalking Club. The festival will include walks to the Galtees and Knockmealdown Mountains. The Kilbeheny Community Centre will be the event centre for all walks. Registration will take place at the Kilbeheny Community Centre from 1 hour prior to the bus departure up to 15 minutes prior to the bus departure for any particular walk. The walks will be graded as follows. A Walk : Fast Pace, Strenuous, Duration up to 7hrs, Total Ascent up to 1400m, Distance up to 25km. B walk : Tough, Good Pace, Duration up to 6hrs, Total Ascent up to 1000m, Distance up to 18km. C walk : Moderate, Moderate Pace, Duration up to 5hrs, Total Ascent up to 600m, Distance up to 14km. D Walk : Easy, Easy Pace, Duration up to 4hrs, Mainly on the flat, tracks and paths. All walks are guided and will have leaders and co-leaders appointed by BHC. All participants in the walks are asked to follow the instructions of the walk leaders at all times.